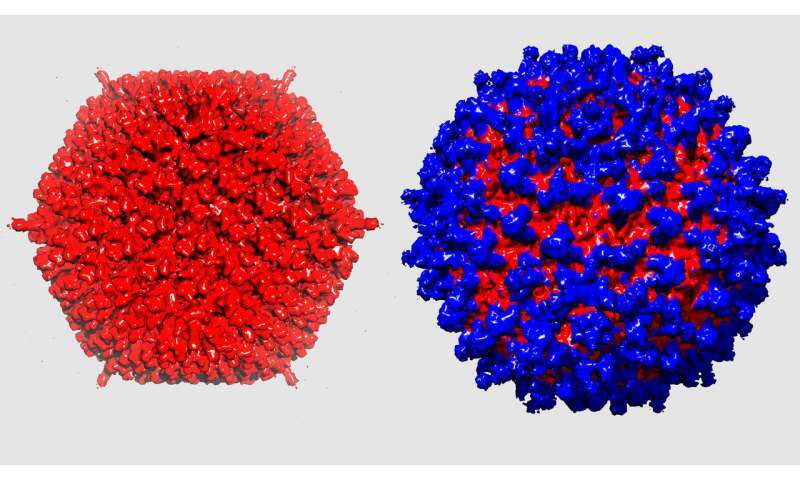 Scientists from the University of Zurich have redesigned an adenovirus for use in cancer therapy. To achieve this, they developed a new protein shield that hides the virus and protects it from elimination. Adapters on the surface of the virus enable the reconstructed virus to specifically infect tumor cells. Viruses have their own genetic material and can infect human cells in a very specific manner. They will then reproduce using the resources of the host cell. These properties make them interesting "gene shuttles" to fight hereditary diseases or cancer. There are innumerable viruses, but the human adenovirus 5, which normally causes the symptoms of a typical cold, has substantial advantages. Its genome can be replaced completely by an artificial one which contains only "useful" genes. Lacking its original viral genes, the virus can no longer trigger diseases. In addition, the genome of the adenovirus is very large, and does not integrate into human chromosomes. Until now, the use of adenoviruses in tumor therapy has been very limited. They lack the ability to infect cancer cells, and therefore cannot inject the genetic blueprints for the therapeutic molecules to fight the disease. Moreover, adenoviruses are efficiently neutralized by the immune system and very rapidly eliminated by the liver. Researchers led by Andreas Plueckthun, professor at the Department of Biochemistry at the University of Zurich, have now rebuilt the viruses so that they effectively recognize and infect tumor cells. "For this purpose, we created molecules that act as an adapter between the virus and the tumor cell," explains Markus Schmid, first author of the study. The adapters, which cling very tightly to the coat of the virus, can, depending on their version, bind to different surface molecules on the tumor cell. The scientists tested adapters for several receptors such as HER2 and EGFR, which are present on various types of cancer cells. Only viruses that were equipped with these adapters were able to infect the tumor cells. In a next step, the researchers hid the virus under a novel protein coat, which serves as camouflage for the virus and protects it from the immune system. As a basis for this shield, the researchers used an existing antibody that they redesigned. In an interdisciplinary collaboration between the research teams, the exact architecture of the complete protective coat was described almost down to the level of atoms. The shield protects the redesigned virus from the immune cells and also prevents the virus from elimination by the liver, which normally removes unmodified adenoviruses from the bloodstream, often making therapeutic applications impossible. The virus, redesigned using sophisticated protein engineering techniques, works. With its shield and its adapter, these viral gene shuttles efficiently infected tumor cells in laboratory animals. Using these stealth gene shuttles, the UZH scientists want to develop novel therapies for different types of cancer. The numerous advantages of adenoviruses will also likely contribute to the development of resistances against drugs. Biochemist Andreas Plueckthun is optimistic: "With this gene shuttle, we have opened up many avenues to treat aggressive cancers in the future, since we can make the body itself produce a whole cocktail of therapeutics directly in the tumor."